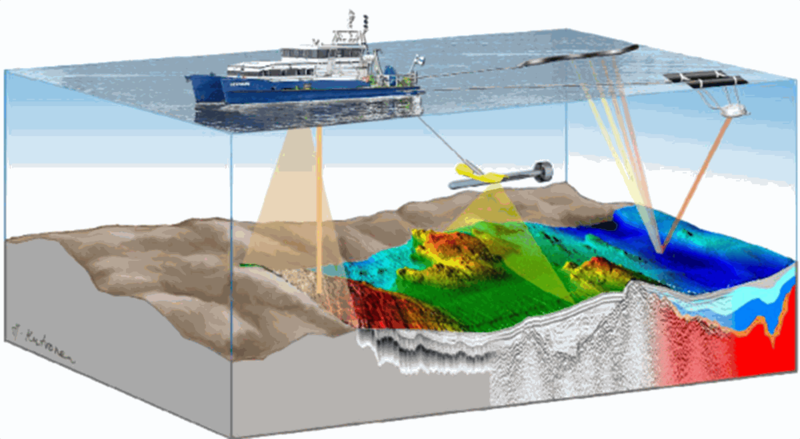 To develop innovative remote sensing technologies for complex real-time sea survey, analysis and monitoring. These technologies integrate and optimize sensors in underwater vehicles of versatile character, adaptable to the objectives and characteristics of each mission. Vehicles will count with efficient bionic communication system for remote transmission of the collected data. This new technology will be efficient, of easy use and optimal for data acquisition. It will require minimum time effort and be easy to deploy and retrieve from the sea. To test and deploy this technology in a complex Baltic Sea survey project for the detection and monitoring of submarine groundwater discharges (SGD) and studying the seabed integrity. Simultaneous inspection of the seabed and the water column will be performed in order to obtain complex data, relevant for the understanding of the implications of the seabed morphology and geological characteristics on the occurrence of SGD. Most relevant detected SGD will be continuously monitored to determinate nutrient and pollutant fluxes, study their importance for the Baltic Sea nutrient balance and ecological status, and understand the influence of human activities. Integrated hydrological modeling will be done in coastal catchments. Collected data will be made available to the scientific community, authorities and policy makers for a better understanding of the Baltic Sea, and for maritime spatial planning.